The foundation of Whitby Abbey was, in part, due to the fulfilment of a vow made by the Christian King Oswy, of Northumbria, before the Battle of Winwaed in AD 655, against the heathen King Penda, of Mercia. 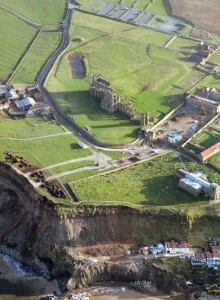 Oswy undertook, in the event of victory, to establish twelve monasteries on his estates: six in Deira and six in Bernicia. 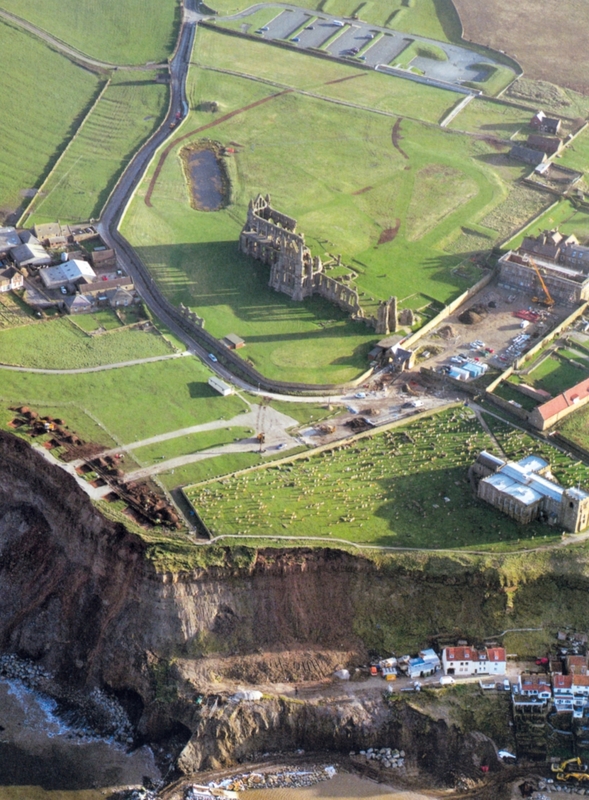 Victory was achieved, and the Abbey at Whitby was set up in AD 657 under the rule of St Hilda a double monastery of men and women that formed a characteristic feature of the early Anglo-Saxon Church. Whitby Abbey figures largely in Bede’s History of the Anglo-Saxon People, and it rapidly achieved a high reputation both for piety and for ecclesiastical training. 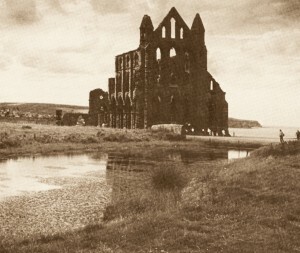 In time it became the burial place for members of the royal house, not least because Oswy also gave his daughter Aelfleda to the monastic life as part of his vow. 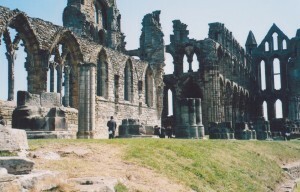 She became the second Abbess at Whitby after Hilda, coming here with St Hilda in AD 657. 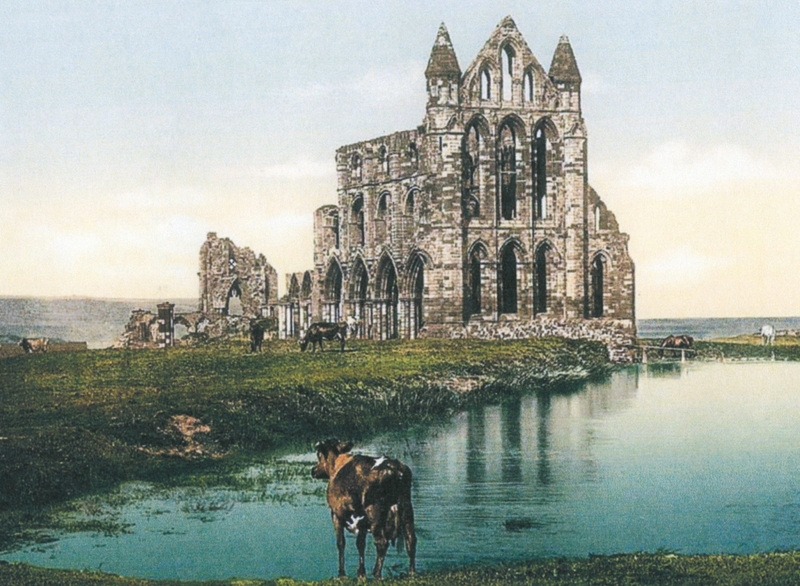 Two events stand out in the Abbey’s early history: the Synod of Whitby and the career of Caedmon. 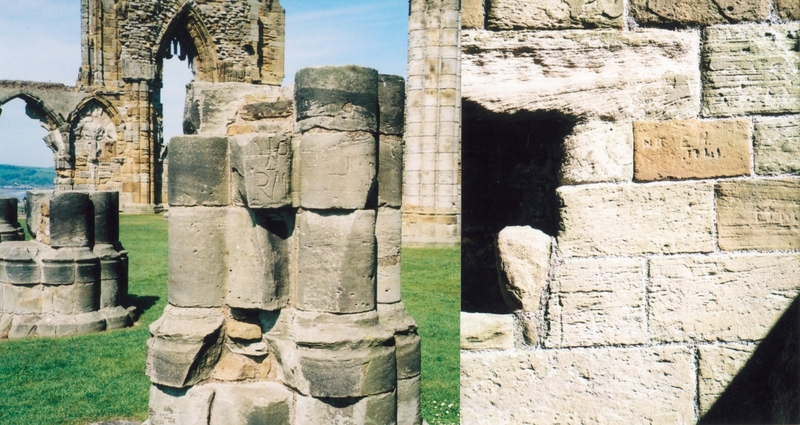 The Synod took place in AD 664, having been convened by King Oswy to settle a number of clerical and liturgical matters that had arisen between the Roman and Celtic elements of the English Church, and in particular how the correct date of Easter should be resolved. Caedmon (d. 680), who became the most celebrated of the vernacular poets of Northumbria, was a farm worker on the lands of the Abbey during the days of Hilda, and known to be illiterate. 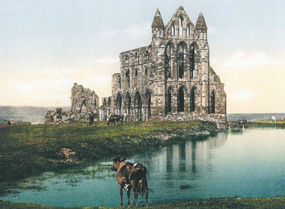 It was following a vision or dream that he began to compose verse, his most famous work being the ‘Hymn of Creation’, which is the first written English poetry. 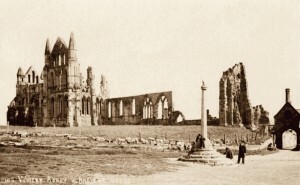 The Anglo-Saxon Abbey was destroyed by the Danes in AD 867, and the site of the ancient monastery laid waste for more than two hundred years. It was re-founded as a priory around the year 1078 by Reinfrid, a monk from the Benedictine Abbey of Evesham in Gloucestershire. 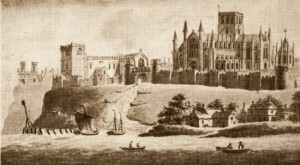 For some time the new Norman Abbey flourished, but by the fourteenth century it had gone into decline. 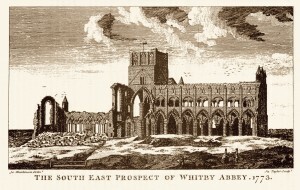 The Suppression of the Monasteries by King Henry VIII from 1539 closed the monastery as a religious house, but the Abbey church, although robbed of its lead roofs, was suffered to remain intact for a number of years afterwards while many others were pulled down, although eventually the stone was reused in the erection of Abbey House. 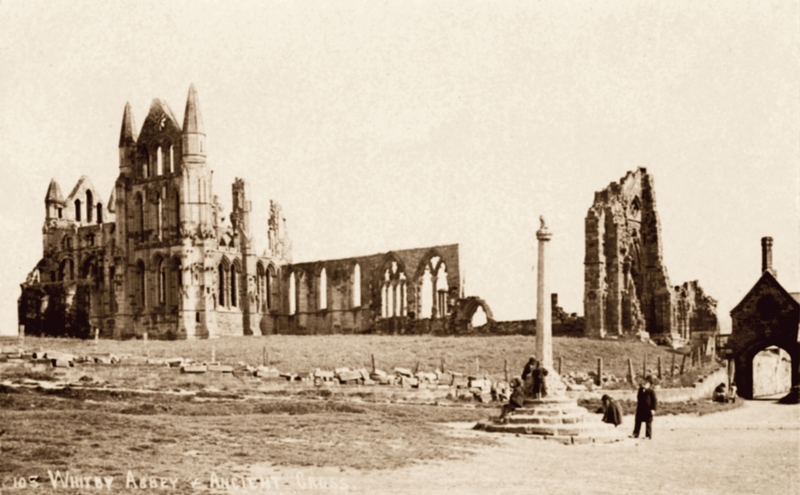 From 1540 the property belonged originally to the Cholmley family, and subsequently to the Fanes through marriage. 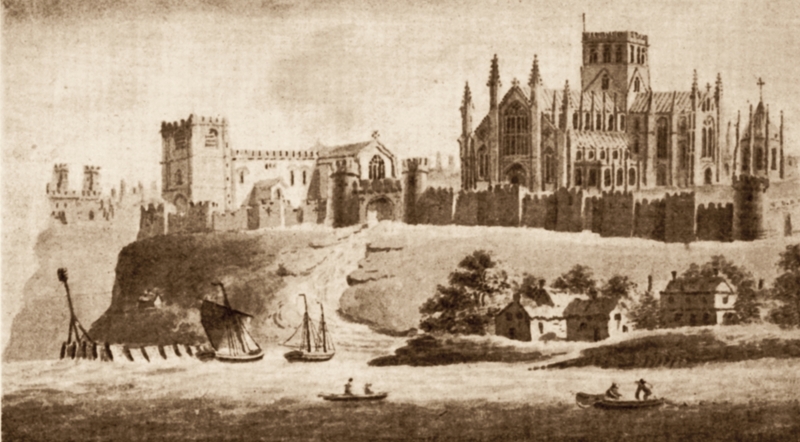 The gradual deterioration of the building over time can be studied in the long series of engravings of which it has been the subject, and much of the stone was taken away to construct Abbey House and other properties. 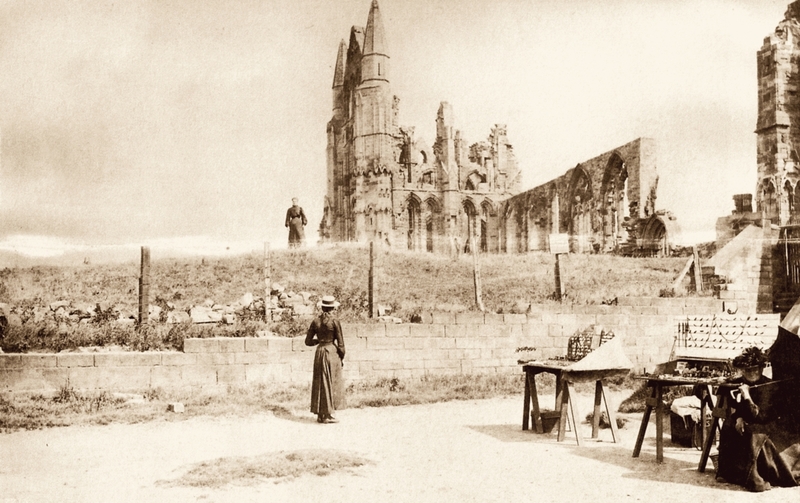 The great central tower fell on 24 June 1830, and damage was caused by German bombardment during the First World War. 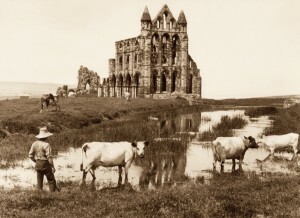 Subsequently, in 1920, the Abbey was given into the guardianship of HM Office of Works, later the Ministry of Public Building and Works, now called English Heritage. 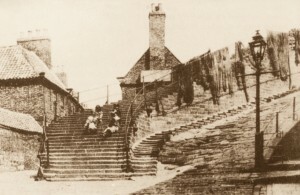 The construction of the present church dates from the 1220s. Archaeological excavations marked out on the ground show that the earlier church was smaller, and the chancel had a rounded end, or apse. Excavations in 1924 to the north of the Abbey revealed remains of the Anglo-Saxon monastery, which unfortunately were not left exposed. The later church is of the Early English style of architecture. After the east end of the second church was completed, the north and south transepts, the central tower and three bays of the nave were not begun until some twenty years later. By that period the cost of the work had put the Abbey into enormous debt. The remainder of the nave was not completed until the fourteenth century and the great west window was inserted in the Perpendicular style a century afterwards. Today, the Abbey ruins are, without doubt, one of the most moving sites in England; situated on a bare, wind-swept cliff, fully exposed to the elements. Iconic and instantly recognised, they are very different from the great sheltered Cistercian valley ruins of Rievaulx and Fountains.